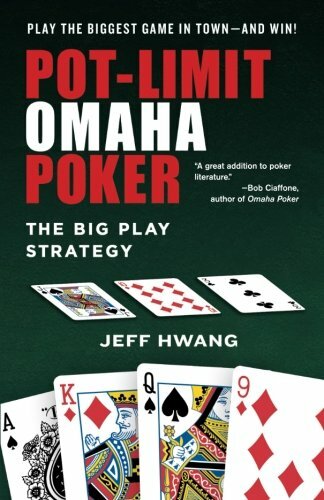 "Pot-Limit Omaha Poker: The Big Play Strategy" was gaming consultant and investment writer, Jeff Hwang's first book. It quickly became the go to book for No Limit Hold'em players who wanted to learn Pot Limit Omaha. On the surface Omaha games appear to look a lot like Hold'em, only with 4-hole cards instead of 2. In this book Hwang goes through the three major variants, explaining their differences and how to approach them, presenting a tight strategy with the aim of winning your opponents stack. "Pot-Limit Omaha Poker: The Big Play Strategy" looks primarily at four-card, high only Pot Limit Omaha. Hwang presents a tight aggressive strategy with the aim of winning large pots and stacking your opponents. He starts by outlining the main differences between Hold'em and Omaha and looks at the potential of big drawing hands. Then starting hands are covered, followed by post-flop tactics and situations. Hwang then gives the same treatment to the two types of High/Low Split Omaha games, Limit and Pot Limit. Each section ends with a number of hand quizzes, to help explain the ideas and test the readers new-found knowledge. Finally miscellaneous topics, such as bankroll considerations, volatility and straddling are included. One major criticism often heard of "Pot-Limit Omaha Poker: The Big Play Strategy", is the incredibly tight style it teaches, especially for online play. When the book was first released in 2008 you could often find full ring Omaha games on all the major sites. If you are looking for a full ring game nowadays, you will struggle to find them running at any level higher than micro-stakes. Instead these have been replaced by 6-max games, which require looser and more aggressive play as the blinds come around quicker. However, this is a book aimed at beginners and as such does a good job at teaching the fundamentals of the three different Omaha variants. If you are interested in learning Omaha this is a good book to get you started. Hwang teaches a solid strategy for each of the three variants and the concepts are written in a way that is easy to understand, explaining them very clearly. While fitting all three games into one book does mean they are all only covered at a basic level, the lack of literature on Omaha means even players familiar with the game may discover something new. So whether you are new to Omaha, or already play the game fairly often, "Pot-Limit Omaha Poker: The Big Play Strategy" is a book you will want to read.